Endometriosis is defined as the presence of endometrial tissue (glands and stroma) outside of the uterus. Although several theories exist to expain this finding, most experts believe endometrial tissue flows in a retrograde fashion from inside the uterus, through the fallopian tubes, and into the pelvis and abdomen. Patients with endometriosis have variable symptoms. For example, many patients with endometriosis have no symptoms and are therefore unaware that they have the condition. However, many patients do not have symptoms of endometriosis – commonly patients complain or suffer from pelvic pain and infertility. Endometriosis can be found practically anyhwere (picture, above right) but is often found on the ovaries, fallopian tube, bowel, and on the surfaces within the pelvis. Interestingly, endometriosis has even been found in the lungs and brain. Endometrial tissue outside of the uterine cavity remains hormonally receptive and active. As women experience menstrual periods, the endometrial tissue, commonly referred to as implants grows, secretes fluid, and often causes inflammation and the development of scar tissue. Scar tissue development can interfere with pregnancy by limiting the mobility of the pelvic structures such as the fallopian tubes and ovaries. Endometriosis can damage one or both fallopian tubes due scar tissue formation or the deposition of endometrial implants on or near the fallopian tubes. Endometriotic implants, inflammation, and scar tissue formation also often cause pelvic pain and painful menstrual periods. Technically, endometriosis is diagnosed using a microscope by a pathologist after examining a small tissue biopsy obtained by your doctor during surgery. However, many patients do not undergo surgery or do not have a biopsy performed. In general, endometriosis is diagnosed by surgical visualization and evaluation of your pelvis; surgery also allows your doctor to attempt to “treat” endometriosis at the time of surgery. Although endometriosis has a variable appearance, it is often dark and is often described as having the appearance of gunpowder (picture, right) in medical textbooks. Occasionally, endometriosis will cause the development of a cyst filled with endometrial tissue on or within the ovary referred to as an endometrioma (picture, below). What infertility treatments are available for patients with endometriosis? As always, treatment(s) should be individualized and we recommend you discuss treatment options and considerations with your doctor. 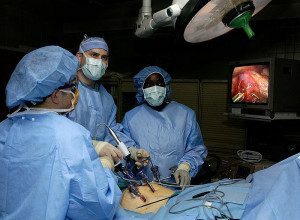 Mild to moderate endometriosis may be treated with laparoscopic surgery (picture, right) that attempts to address abnormal scar tissue and restore normal anatomy. Although studies are limited, most patients will receive a modest improvement in pregnancy rates (3-6 % per month) after surgical treatment of mild endometriosis. Unfortunately, surgery can cause new scar tissue formation and/or the the development of new endometriosis can occur. By far, the most effective treatment for endometriosis is in-vitro fertilization. Patients with severe endometriosis may want to consider IVF as an early treatment option due to its effectiveness in helping patients with endometriosis achieve pregnancy.